Strength can come in many forms. But for some, such as Eleni, strength was necessary for survival. 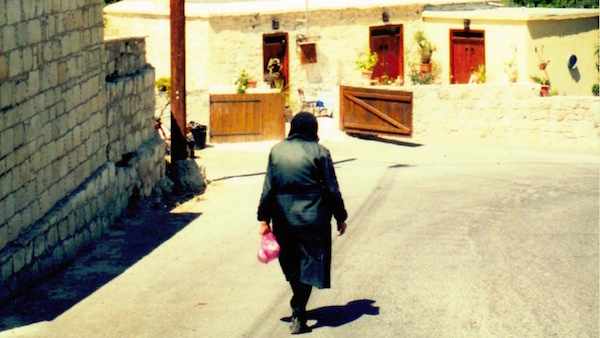 Escaping from Cyprus during the civil war in the 1960s, Illona shares a tale of struggle, defiance, and an unwavering faith in God. For her, freedom was ensuring a better life for her three children in Australia. So where were you born and in what year? I was born in Cyprus in 1940. Describe the place you speent your childhood? I spent my childhood in my country and I had a lovely time. As a family we were very close when I was very young. Of course, it was the war, but we didn’t have any problems there – it was WWII, but not in Cyprus. And we had a lovely time. [Throughout] primary school, we used to move a lot. We knew nearly the whole country. We moved [throughout] the whole island anyway (because it’s an island). So at some point you stopped being able to move throughout the whole country? Later, when I was old enough and I had my own family; I was married. Then came the trouble in my country and they separated it – north and south. And I had to leave my home, one morning, and was never able to go back – with 3 kids in the car. As a family, we left from where we used to live, went to the south, and we were not able to ever go back there [to the north]. Can you describe a sensory memory (favourite meal, a smell or anything)? Oh, it was Greek food! We always had a lot of different food. My mum used to cook a lot when we had breakfast, lunch, and dinner. My Dad was working for the government, so we had everything; we were well looked after. Is there anything from your childhood that you remember in particular? The only event I remember, because my Dad was working for the government, is that we used to move a lot; like from one district to another district, to another district. You have your friends and you make friends at school, [and you have] your neighbour. And then you had to leave and go to another place. I moved a lot. And when my husband was working for the government, I had to move again. And then the war came and I had to move again and come to Australia. So that was something as a child you remember [in] every detail because you move from one place and you think ‘this happened in this place and that happened in that place,’ and that’s how you remember everything. I live in Bass Hill. Oh yeah, I’ve been there – how many years… 26 years? Is that the longest time you’ve lived in one place? Yeah, it is. Certainly. Because with the others it was 2, 3, 4, 5 [years], something like that. So that was the longest one. What dreams do you have for your future or what dreams did you have for your future when you were young? I just wanted to have my own home and be able to send my kids to university. I couldn’t go to university because we didn’t have a university in our country at the time. They have [universities] now, but not at that time, and I wanted my kids to be educated. That’s why I decided, instead of living on the other side of the country. to come to Australia, so they could go to universities. That was my dream; to have my kids finish school and come home and not to go to another country to get their extra education or whatever. Because it’s a small country, Cyprus, and that time we didn’t have university. They have now, but not at that time. Did your kids go to university? All my kids went to university except one. He went to college to study about hairdressing. But the other two – they went to universities – the other 2 girls. You can have strength if you have faith. If you have faith in God it gives you strength, and it makes you stronger, and you fight harder for anything you want to do. That’s what I wish for anybody. To have faith. And the faith gives you strength. If I didn’t have any faith… When we lost our house with three little kids – and survived. The faith makes you stronger and you fight harder and you survive. And I’m very pleased that I had that with my life. What gave you that faith? It’s your religion. If you believe in God or whatever god you have, or whatever you believe, it gives you power. It gives you strength. Your faith it gives you strength and you fight for everything. For me, that’s what it is. If you believe in God and it gives you strength for sure, then you can fight anything. Sickness, [or] things that you don’t have and want to have – it gives you the power to make all these things. I think everybody should have faith in God. What is the most difficult thing you’ve had to overcome? From the war; to put my three kids in the car, under the [fighter] aeroplanes, and take them to the other side where there wasn’t a war – and Maria was only 23 months [old]. So I don’t wish [it on] anyone; to be in a war place or a war time. That’s what gives you strength, because you have your young kids and you have to raise them up. And when you have faith, then you face it and you fight. But it doesn’t take the pain away. All the pain, even now, when I remember what happened… Yeah the pain – it’s always there. But you come over it, because you have to. You have your strength; you understand you have to [do it] and you do it. And you say, “I’m going to see better days if I still fight it and have strength”. Life goes on, so you have to. And I don’t understand, these days, when people say they have – what is the word – ‘depression’. Why do you get depression? You have to fight, [with] whatever you have. Or whatever your problem is. People give up, or they don’t have faith that someone is going to help them from above. Do you think if you didn’t have the children, the young children that you would have still fought in the same way? Maybe not – I don’t know. I can’t say. But, like I said, because you have your faith and your God and you believe in Him [and] that He’s going to help you, even if I didn’t have kids. But you don’t fight as hard as when you [don’t] have your kids to fight for. Maybe – I don’t know. How did you turn that into a personal strength for yourself? Like I said, you have to live so you can give a life to your kids and support your kids; so you fight for them. You’re going to ask me “how did you find it on the other side? How did you find money or food for your kids?” We had our difficulties, but we passed them. We used to eat whatever we had there at the table. A lot of people from other countries, they sent stuff; [we made] the most of whatever they give you. Like they used to give us clothes or tins or whatever, and then we [found] work there. Then we [got] money and we came to Australia and we didn’t ask for one cent. Not for a day. Because we stayed two years there, we made the money for travelling to come here. We had relatives here. [When] we came they helped us, too. But we went to work straight away [and] didn’t ask for a cent. We came with a visa [and] the only thing they gave us was Medicare. We didn’t ask for anything else in Australia. We worked hard and God helped us and we are where we are today. What are your dreams now? To see my grandkids and my great grandkids grow and have a peaceful life. Because that’s why we came to Australia – for peace. Because in the war, we didn’t know when there was going to be another trouble. And you come to a country [like Australia] so you can have peace and quiet. We’ve had many years like that, but not lately, anyway. That’s another story. Everything. How you think, how you live, how your plans go – you need your freedom. Freedom is the best thing; you have to have your freedom. That’s why we didn’t want to stay [in Cyprus] because there was no freedom. They were [invading] our half of the island, so you didn’t know when they were going to come and fight again. So we wanted to leave and go somewhere to find peace. And freedom.